Patriot Gold Corp., a gold resource and exploration company, today provided a comprehensive update on exploration and development plans for the Moss Gold-Silver project located in Mohave County, Northwestern Arizona. 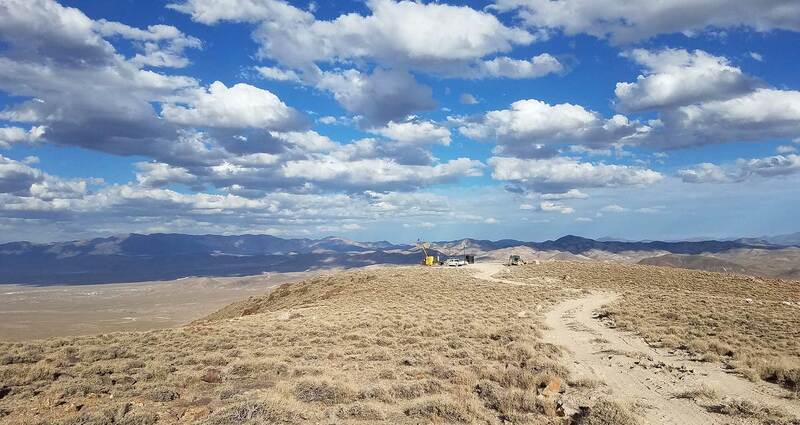 "With the recent positive updates on the progress of the Moss Gold-Silver project, we continue to recognize the importance of keeping our shareholders and supporters informed throughout this intensive process," said Bob Coale, CEO of Patriot Gold. "As such, we are pleased to be able to provide a comprehensive summary and update on the Moss project plan thus far. This includes a detailed 3 Phase Development Model approach that has been put in place to ensure that certain objectives will be met so we can effectively and efficiently achieve maximum production at the Moss site in the long-term." The Moss property is located within the historic Oatman Mining District in Mojave County, Arizona which is 10 miles east of Bullhead City, Arizona and approximately 70 miles southeast of Las Vegas, Nevada. The Moss deposit is a low-sulfidation epithermal deposit having grade consistency and homogeneity along its 2 km strike length and remains open down dip. The Moss deposit is a mineralized quartz-calcite vein and stockwork up to 45 feet wide; it strikes approximately N70 degrees W and dips 65-75 degrees SW; the outcropping surface trace has a strike length of 5000 feet. The Moss property hosts low sulphidation epithermal vein-type gold mineralization. A comprehensive resource definition drilling program is currently underway in the starter open pit mine area with a focus on two central hills with significant vein outcropping at surface. Drill results will be utilized in testing the extensions of the known mineralization, in mine modeling, to streamline the initial mine design of the starter pit and to add additional resources to the planned Phase 2 Mine Plan. Drilling to expand the resource is expected to continue into 2014 and also target increasing the resources available for the Phase 3 Mine Plan. The internal target is to add 250,000 ounces of gold equivalent adjacent to the currently planned pit areas thereby extending the mine life by three years or enabling expansion of the current design capacity from 10,000 tpd to 13,300 tpd. Surrounding property exploration program - A drilling program is expected to commence in early 2014 and will be ongoing throughout the first few years of mine operation. This will be a property wide program aiming to add a million ounces to the resource statement. The target for the Moss property as a whole will be 2 million ounces of gold equivalent. In a recent news release dated October 31, 2012, Patriot Gold reported the final updated NI 43-101 compliant mineral resource estimate report for the Moss property. These results were reviewed and compiled by Scott E. Wilson Consulting Inc. 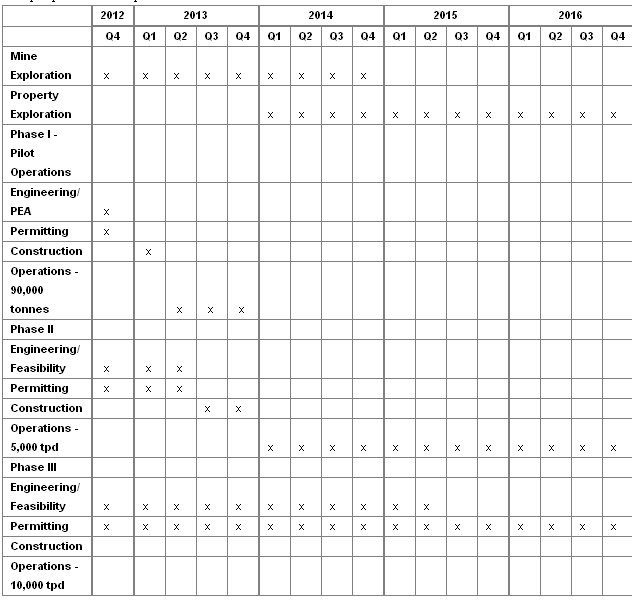 The table below shows the final technical report resource estimate. This plan is designed to sequentially progress the project from conceptual design and laboratory test work to pilot plant testing in the field and, if this is successful, to secure financing and permitting approval for building a 5000 tonnes per day mine initially and, if this is successful, then move to 10,000 tonnes per day ultimately. The mine, should it proceed to production, will be a classic heap leach operation. The business plan has been specifically designed to take advantage of the natural attributes of the Moss deposit while minimizing the capital required to get into production and minimizing the lead time in doing so, thereby reducing project development risk and capital risk.The immediate goal is the completion of a Preliminary Economic Assessment (PEA) which will incorporate mine, processing and heap leach designs. This will also include estimates of capital and operating costs and pre-tax cash flows for Phases I and II. A scoping level analysis will be subsequently prepared for Phase III. The PEA is expected to be completed in early 2013. Phase I is a pilot plant operation with operations expected to commence in Q2 2013. Phase II operations are expected to commence in Q1 2014 at a rate of 5,000 tpd. Phase III operations are expected to commence in Q4 2017 at a rate of 10,000 tpd. These numbers are being used as the basis of the PEA now underway and are subject to review. The employment plan to execute on the 3 Phase Development Plan is to support local communities and businesses wherever possible for both employment and mine supplies and services. Preliminary estimates of direct and indirect employment for each mining phase are listed below and utilize a multiplier effect of 3:1.